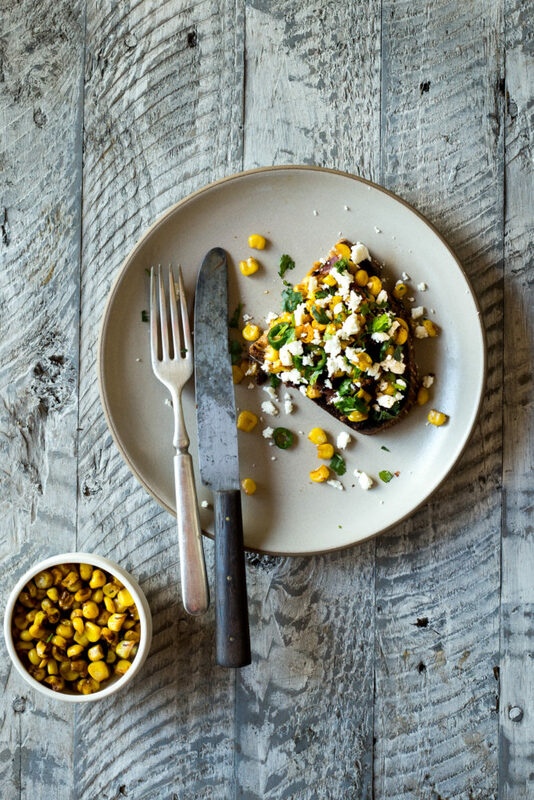 This sweet corn and bacon relish is the perfect topper for a thick slice of toasted bread. This makes for a tasty lunch but I suppose you could even serve this relish on grilled chicken, roasted potatoes or even served with a bag of tortilla chips. We picked up some good quality bacon from the farmers market, bread from our favorite bakery and everything else comes straight from Tumbleweed Farm. I love this time of the year and each meal just gets better and better! This meal tastes best when enjoyed with good company and a pint of your favorite beer. Cheers from Tumbleweed Farm! Cook the bacon in a large skillet over medium heat until lightly crisp, about 4 minutes, stirring occasionally. Add the scallions and jalapeño pepper. Cook for about 2 minutes longer. Add the wine, scraping down the pan to loosen the brown bits. Stir in the vinegar, pinch of sugar, corn, salt and a healthy pinch of black pepper. Continue to cook for about 3 minutes longer. Remove from the heat and set aside. Divide the toasted bread among plates. Top with the sweet corn and bacon relish. Garnish with plenty of Cotija cheese, minced cilantro and a drizzle of olive oil. Season to taste with additional salt and pepper if necessary.